Launching this week, the BT Manager of the Month award celebrates landlords who make their pub more than a pub, highlighting their role in connecting sport with the community. 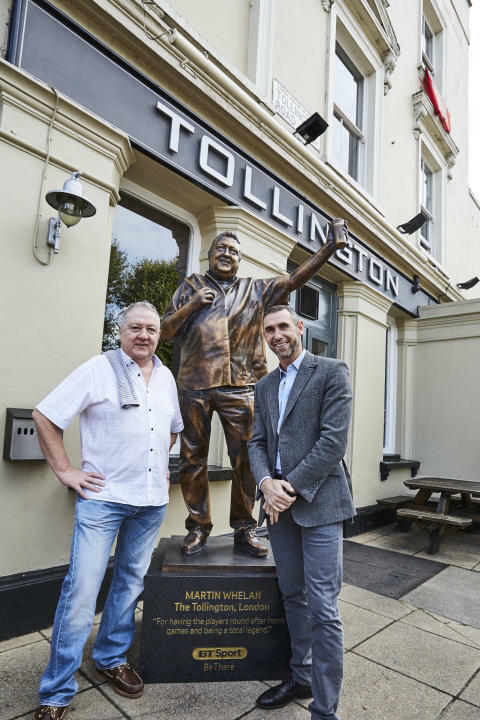 To kick-start the awards three statues will be unveiled across the UK, at The Tollington (London), The Chequers (Lutterworth) and The Gardener’s Arms (Norwich), with Martin Keown, Robbie Savage and Jake Humphrey unveiling the statue of each respective landlord. All the winning pubs stood out from the competition thanks to the uniqueness of their venues, whether it be painting the pub to match the local team’s colours, TVs in the toilets, or getting the players from their local team in after the game. The search for the next winners is already underway, with BT Sport inviting people to nominate their landlords, or for landlords to nominate themselves by tweeting @BTSportsBars using #BTMOTM. BT Sport will be looking for landlords that go above and beyond to bring sport to their customers. This could include the viewing experience or wider community projects that get people involved in sport. BT Sport will select one landlord a month until June 2018 and each will be presented a trophy by a local sporting personality and a brand new 4K TV for their venue. BT Sport Manager of the Month is a free to enter promotion. In order to enter you must use the #BTMOTM and tweet @BTSportbars with the name of the landlord, pub and why they deserve to win. Winners will be chosen based on the best reasons why they should win rather than the total number of nominations and as such will be at the sole discretion of BT Sport. In order to be considered all nominated pubs must be a commercial BT Sport customer at the time of entering. All monthly winners will receive 1 x 65 inch 4K TV for their venue, a BT Sport MOTM winners pack and presentation of the trophy from a local sporting personality. Upon accepting the award you will automatically be included in marketing as part of this campaign. All information correct at time of writing (Sept 2017), but are subject to change.